Olive oil has long been the crème de la crème of oils, but now, there’s a new kid on the block. Both coconut oil aand olive oil are well known for their effects on the heart, skin, hair, and overall health which has got us all asking which one is actually better. In this article, we’re going to explore the benefits and advantages to each one and explain exactly why they should both be a staple in your cupboard. Though, saying that they both have their upsides would be a bit of a cop out, so we will also let you know which is better to grab for your cupboard when in a pinch. Both olive and coconut oil are pure fat sources. Fat was once thought to be the ruler of all evil in the nutritional world; giving you cardiovascular disease and causing obesity with just a glance. Thankfully, that’s all been debunked in recent years and now we know that fat is actually quite beneficial for the body, especially from the right source. The majority of olive oil is composed of unsaturated fat and in particular, monounsaturated fat. One of the biggest reasons for olive oil’s popularity is that it’s a staple of the Mediterranean diet which is rich in monounsaturated fat from other foods such as oily fish. In fact, the dietary range of virgin olive oil in the Mediterranean diet ranges between 25-50ml per day. This type of fat is linked to lower levels of blood pressure alongside lower levels of LDL or the “bad” cholesterol. In turns, this makes them beneficial for the heart and puts you at a reduced risk of heart disease and stroke. On the other hand, coconut oil is predominantly comprised of saturated fat. After fat was found to be quite useful, the media needed something else to demonise and so turned their attention to saturate fat as the artery-clogging component of our diet. In actuality, saturated fat isn’t bad for us either and is actually very important for hormonal function. Coconut oil in particular is a rich source of molecules called MCTs or Medium-Chain-Triglycerides. The fat inside coconut oil helps with brain function, improve HDL or “good” cholesterol and lower the triglyceride level of our blood which can contribute to heart disease. Coconut oil also contains a fat called lauric acid which has antimicrobial and anti-inflammatory properties to improve your immune system and fight infection. Both olive and coconut oil contain antioxidants which help to reduce oxidative stress on the body and prevent a number of health conditions from occurring. However, olive oil tends to hold a greater level of antioxidants including phenolic compounds which can reduce inflammatory compounds. 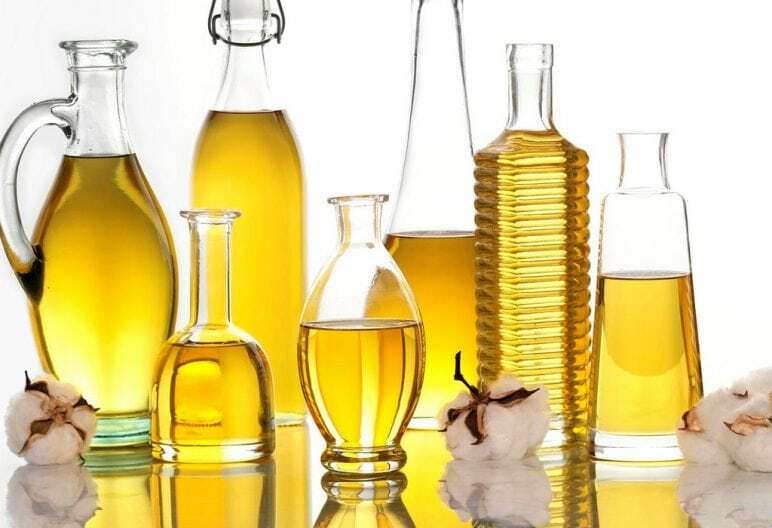 You can tell the difference between whether an oil holds more saturated or unsaturated fat based upon its appearance. Saturated fats will be solid at room temperature (think coconut oil, butter, ghee, animal fat, etc.) whereas unsaturated fats are liquid at room temperature (olive oil, vegetable oil, peanut oil, avocado oil, etc.). Saturated fat Is also much more stable under high temperatures making it perfect for cooking. The smoking point of olive oil is around 280 degrees Farnheit whereas coconut oil holds a much higher smoking point at 350 degrees Farenheit. This means that olive oil needs to be kept at a lower heat whereas coconut oil can be extremely practical for frying. If olive oil is taken past this smoking point then compounds can be create which are damaging for your health. You can still use olive oil for baking, but just make sure to keep it under that temperature. If you are planning to cook with olive oil, then use a cheaper option and save the more expensive high quality oils for salad dressings where you can appreciate the taste. In order for this to be a complete review, we need to address all of the uses these oils have. Above and beyond your diet, olive oil and coconut oil are frequently used for various beauty treatments on the hair and skin. Olive oil can nourish and soften your hair whilst giving it a nice shiny effect due to its rich fatty acid profile. Coconut oil also works as a conditioner, moisturizer and even make-up remover whilst protecting from protein loss by working deep into the hair shaft. Both olive and coconut oil will help to leave your hair softer and shinier whilst reducing frizz. You can even mix them together to combat dryness using one-part coconut oil and one-part olive oil mixed and warm. Due to coconut oil’s anti-bacterial and anti-fungal properties, it works as a great skin treatment to battle against acne. This is only improved by the antioxidants which can prevent against premature aging as well as degenerative skin diseases. On the other hand, olive oil works as a natural hypoallergenic, improving the moisture levels of your skin and also providing a s high level of antioxidants. Olive oil works better for treating sun-damaged skin or skin that’s experienced a harmful environment from pollution thanks to the vitamins A and E. Once again, mixing them together gives the best results, but for this concoction, go a little heavier on the coconut oil with 3 parts to 1 part olive oil. In this scenario, the better the quality of the olive oil, the better your results, too. So, which is actually better? Well, as you can see if you can keep both in your cupboard, then you’re going to derive benefits from each. However, that’s probably not quite the answer you’re looking for. If you’re going to be frying, cooking anything at a high temperature or baking something sweet, then coconut oil is most likely your better option. Yet, if you’re going to be dressing anything or baking something savoury, then opt for olive oil. Coconut oil can leave quite a strong coconutty taste on your food whereas olive oil tends to be more neutral. The taste of the coconut oil will differ depending on the product you purchase, so take a whiff before buying as the stronger the smell, then the stronger the taste will be.